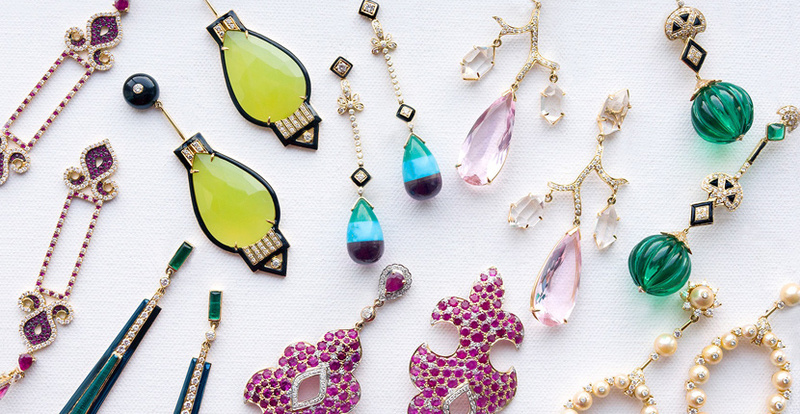 Like a well-made cocktail, my jewelry is a mix of ideas ranging from Mughal influences tossed with architectural inspirations, shaken with abstract coloring then stirred with art nouveau and art deco helpings. I hope it is intoxicating for the senses. For just over ten years Hanut Singh has flown under the radar, quietly and meticulously designing jewelry that at once reveals his modern sensibility, appreciation of history and obsession with craftsmanship. The personal touch he applied to his creations extended to the way he presented them for a decade, exclusively at private trunk shows and by-appointment only boutiques. From these intimate presentations a word-of-mouth buzz spread about Hanut’s talent. Over time he gained a Who’s Who list of clients including Lauren Santo Domingo, Diane von Furstenberg, Mary-Kate Olsen, Wendi Deng Murdoch, Beyoncé, Madonna and Tory Burch. Outside these rarefied circles, the only other way to discover the jewelry might be a piece of press here and there, a social media mention or a glimpse of something on the designer’s magical Instagram. Today his jewelry can be found upon occasion in Moda Operandi trunkshows or at the legendary Fred Leighton boutique in New York. So who is this jewelry talent? Hanut Singh is a descendant of the Kapurthala royal family of India who astonished the world with their style in the first half of the twentieth century. The family’s legendary treasures and discriminating taste inspired the greatest jewelry houses in the world to new heights. It also ignited Hanut’s passion to become a designer. Although he was never formally trained, Hanut’s jewelry education truly began from the time he was a child learning about the collections of his ancestors. 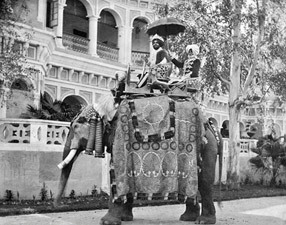 Hanut’s great grandfather the Maharaja Jagatjit Singh on an elephant in front of his pink palace. Hanut’s great-grandfather, the Maharaja Jagatjit Singh was a friend of American President Theodore Roosevelt and French statesmen Georges Clemenceau. He was a Francophile and built a pink palace in India inspired by the architecture of the Élysée Palace in Paris. The Maharaja took annual trips to the City of Lights and often commissioned jewels from the esteemed French houses. One of the most spectacular was a pagoda style tiara made by Cartier in 1926. It was set with eye-popping emeralds from the family’s gem collection. Hanut’s glamourous grandmother the Princess Karam. Hanut’s grandparents the Maharaja Kumar Karamjit Singh and Maharani Sita Devi of Kapurthala—also known as the Princess Karam—continued the relationships with the best French jewelers during their frequent visits to Paris in the 1930s. Cartier’s artistic director Jeanne Toussaint conceived an Indian-style necklace for and inspired by the princess with motifs the Maison repeated on designs for decades. 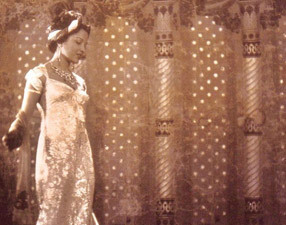 The Princess Karam’s beauty and style, the way she paired her jewels with sensational saris and couture gowns from Chanel, Lanvin and Elsa Schiaparelli, led Vogue to proclaim she was a “secular goddess” in 1932. Five-years later, Harper’s Bazaar put her on a short list of the most beautiful women in the world. 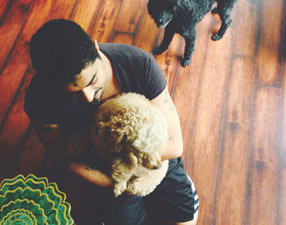 Hanut Singh with his poodles in his New Delhi penthouse apartment. Hanut’s stunning penthouse apartment in New Delhi is filled with inherited items from his grandparent’s café society days. There are gifts from their friends including Coco Chanel. Louis Vuitton traveling trunks the glamorous couple packed for their journeys abroad accent his home. A glorious Golconda diamond ring Hanut’s grandfather commissioned for his grandmother from Louis Cartier is certainly his most valuable inherited treasure. Perhaps Hanut’s most prized possession, however, is his grandmother’s scrapbook filled with memorabilia of the era. It includes several celebrated portraits of the legendary beauty wearing her spectacular jewels. One image is by Man Ray. Another taken by Cecil Beaton is signed by the celebrated lensman. This personal assemblage acts as an eternal inspiration board for Hanut. Hanut Singh Crescent Moon earrings with chrysoberyl, tanzanite, paraibas and diamonds on Aziza Azim. Splashes of enamel, an element of 1920s jewels, show-up in several of Hanut’s creations. “I use it to enhance a stone and give it a linear modern pop,” he says. To get texture into the earrings, Hanut often buys rough stones and has them carved to his specifications. During the art deco days, it was carved gems Indian nobility brought to French houses for their special commissions that ignited the carved gem craze of the era. Just as jewelers did in the roaring twenties, Hanut carefully selects graduated gems to hug the curves of his jewels and adds small cabochon shaped stones to the finials of designs. Hanut uses antique pearls for his pieces because he prefers the patina of the older gems. Classic elements are blended with Hanut’s signature modern details. Slender gold bars and little gold jump rings often connect the parts of his earrings together. The yellow gold used on most of the designs makes them feel less formal than traditional art deco work that was made in platinum almost exclusively. An immaculate sense of proportion infuses Hanut’s jewelry with a timelessness and absolutely of the moment quality. “I do jewelry for people to wear and enjoy, not something to lock up in a vault,” says the designer. 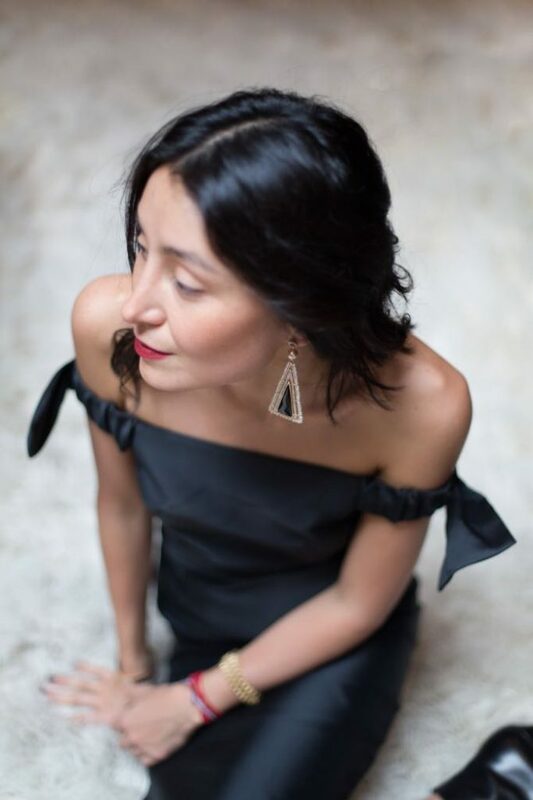 One of Hanut’s muses Aziza Azim shows in the pictures here how easily the earrings can be worn with leather moto jackets as well as little black dresses. There is no doubt Hanut Singh’s creations are everything he wants them to be—totally intoxicating for the senses.